This oil sketch or modello was commissioned by Prince-Bishop Viet Adam for the main altarpiece of Freising Cathedral in southern Germany. In the center the Virgin Mary holds the Christ Child while trampling the serpent of sin, who curls around the moon at her feet. To the left the Archangel Michael and angels cast out Satan, the "great red dragon with seven heads," and other ghoulish demons. Above, God the Father instructs an angel to place a pair of wings on the Virgin's shoulders. 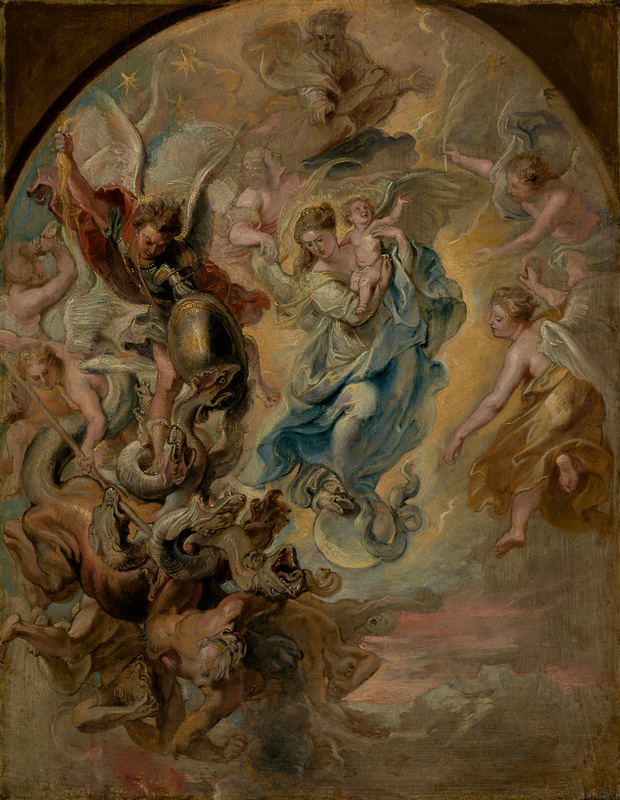 Peter Paul Rubens contrasted good with evil by juxtaposing the agony and gruesomeness of the demons as they fall into hell with the Virgin and Child rising heavenward at the right. Rapid and gestural brushstrokes lend immediacy and drama to the scene. Edmund M. Blood (London, England), sold through Wilhelm von Bode (Berlin, Germany) to Eduard Friedrich Weber. Walter M. Feilchenfeldt (Berlin, Germany; London, England; Zurich, Switzerland) and Galerie Paul Cassirer (Berlin, Germany; London, England; Zurich, Switzerland), sold to Alfred Hausamann, 1938. Alfred Hausamann (Zürich, Switzerland), sold through Walter Feilchenfeldt (Zurich, Switzerland) to the J. Paul Getty Museum, 1984. Meichelbeck, Carolus. Kurtze Freyingische Chronica oder Historia. (Freysing: 1724), vol. I, p. 288. Rooses, Max. L'Oeuvre de P.P. Rubens, vol. V. (Antwerp: 1892), no. 384bis, p. 331. Woermann, Karl. Wissenschafliches Verseichnis der älteren Gemälde der Galerie Weber in Hamburg. (Dresden: 1892; 2nd edition Dresden: 1907), no. 165, pp. 136-37; 2nd ed., no. 191, pp. 164-65. Gemälde alter Meister der Sammlung Weber. (Lübeck: 1898; second edition Leipzig: 1923), 17. Rosenberg, Adolf. "P.P. Rubens-Des Meisters Gemälde." Klassiker der Kunst. (1st edition Stuttgart and Leipzig: 1905; 2nd edition Stuttgart and Leipzig: 1906; 3rd edition Stuttgart and Leipzig: 1911), 1st ed., repr. p. 52; 2nd ed., repr. p. 52, pp. 466 and 490; 3rd ed., repr. p. 52, pp. 468 and 491. Dillon, Edward. Rubens (London: Methuen and Co., 1909), p. 218, pl. XLV. Burchard, Ludwig. "Anmerkungen zu den Rubens-Bilder der Älten Pinakothek in München." Kunstchronik neue folge, vol. XXII, no. 17. (February 23, 1912), no. 739, p. 260. Katalog der Königliche älteren Pinakothek. (Munich: 1911), no. 739, pp. 134-35. Glaser, Curt. "Die Sammlung Weber." Repertorium für Kunstwissenschaft, vol. XXXV. (1912), p. 94. Schaeffer, Emil. "La Vendita della Collezione Weber a Berlino." Rassegan d'Arte, vol. XII, nos. 4-5. (April - May 1912), p. 76, repr. p. 76. Katalog der aus der Sammlung des kgl. Rates Marczell von Nemes-Budapest ausgestellten Gemälde, exh. cat. (Düsseldorf: Städt. Kunsthalle, with A. Bagel, 1912), unpaginated, no. 29, ill.
"La Collection Marczell de Nemes." Les Arts. (June 1913), p. 23. Oulmont, Charles. "Collection M.-F. Gentili di Giuseppe." Les Arts, vol. XIV. (1917), no. 162, p. 7, repr. p. 15. Feulner, Adolf. "Zu Datierung des Apokalyptischen Wiebesvon P.P. Rubens." Monatschefte für Kunstwissenschaft, vol. XII. (1919), p. 342. Oldenbourg, Rudolf. "P.P. Rubens-Des Meisters Gemälde." Klassiker der Kunst, fourth edition. (Stuttgart and Berlin: 1921), no. 240, p. 464. Katalog der Älteren Pinakothek zu München. 14th ed. (Munich: Die Pinakothek, 1922), pp. 142-43, no. 891. Ältere Pinakothek München. 18th ed. (Munich: Carl Gerber, 1936), no. 891, p. 216. Gasser, Manuel, and Willy Rotzler. Kunst Schaetze in der Schweiz. (Zurich: 1964), no. 50., ill.
Held, Julius. The Oil Sketches of Peter Paul Rubens--A Critical Catalogue. 2 vols. (Princeton: Princeton University Press, 1980), vol. 2, pl. 379. Held, Julius. The Oil Sketches of Peter Paul Rubens--A Critical Catalogue. 2 vols. (Princeton: Princeton University Press, 1980), vol. 1, pp. 525-26, no. 389. Weber, Leo. Die Erneuerung des Domes zu Freising 1621-1630. (Munich: 1985), p. 83, note 345, 84-90, fig. 118. "Acquisitions/1985." The J. Paul Getty Museum Journal 14 (1986), p. 215, no. 118. Jaffé, Michael. Rubens: Catalogo completo. Germano Mulazzani, trans. (Milan: Rizzoli, 1989), p. 284, no. 783. Renger, Konrad. Peter Paul Rubens Altäre für Bayern, exh. cat. (Alte Pinakothek, Munich: 1990-1991), pp. 74, 116-17, note 28, fig. 44. Renger, Konrad. "Rubens' Bavarian Altarpieces and Counter Reformation propaganda." Rubens dall'Italia all'Europa: Atti del convengo internazionale di Studi, Padova, 24-27 maggio 1990. (Padua: 1992), p. 29. Carr, Dawson W., and Mark Leonard. Looking at Paintings: A Guide to Technical Terms (Malibu: J. Paul Getty Museum, with British Museum Press, 1992), pp. 22-23, ill.
Yeide, Nancy H., Konstantin Akinsha, and Amy L. Walsh. The AAM Guide to Provenance Research. Washington D.C.: American Association of Museums, 2001, p. 13, ill., p. 148. Renger, Konrad with Claudia Denk. Flämische Malerei des Barock in der Alten Pinakothek (2002), p. 317, ill. p. 318. Giorgi, Rosa. Angeli e demoni (Milan: Electa, 2003), p. 267, ill.
Giorgi, Rosa. Engel, Dämonen und phantastische Wesen (Berlin: Parthas Verlag, 2004), p. 267, ill.
Giorgi, Rosa. Angels and Demons in Art. Stefano Zuffi, ed. Rosanna M. Giammanco Frongia, trans. (Los Angeles, J. Paul Getty Museum, 2005), p. 267, ill.
Sutton, Peter C., et al., eds. Drawn by the Brush: Oil Sketches by Peter Paul Rubens, exh. cat. (New Haven: Yale University Press, 2005), pp. 138-41, fig. 14. Mues Orts, Paula. La libertad del pincel: los discursos sobre la nobleza de la pintura en Nueva España (Mexico City: Universidad Iberoamericana, 2008), pp. 283-84, ill. p. 288, fig. 32. Doherty, Tiarna, and Anne T. Woollett. Looking at Paintings: A Guide to Technical Terms. Rev. ed. (Los Angeles: J. Paul Getty Museum, 2009), pp. 22-23, ill.
Lisboa, Maria Manuel. The End of the World: Apocalypse and its Aftermath in Western Culture (Cambridge: Open Book Publishers, 2011), p. 78, ill.
Weber, Kaylin H. "A Temple of History Painting: West's Newman Street Studio and Art Collection." In American Adversaries: West and Copley in a Transatlantic World, exh. cat. Emily Ballew Neff and Kaylin H. Weber, eds. (Houston: The Museum of Fine Arts, with Yale University Press, 2013), pp. 34, 36-37, fig. 38. Neff, Emily Ballew, and Kaylin H. Weber, eds. American Adversaries: West and Copley in a Transatlantic World, exh. cat. (Houston: The Museum of Fine Arts, with Yale University Press, 2013), p. 245. Sauerländer, Willibald. The Catholic Rubens: Saints and Martyrs. David Dollenmayer, trans. (Los Angeles: The Getty Research Institute, 2014), pp. 39-40, 279n22, cover ill.